This healthy tuna casserole contains homemade cream of mushroom soup and whole grain noodles–perfect healthy comfort food for the days you need it most! This is the recipe that my family loves most, and can be adapted for your family as well! Slow cooker and Instant Pot directions for this healthy tuna casserole are right here. My family doesn’t know it’s healthy, but they eat (and request!) 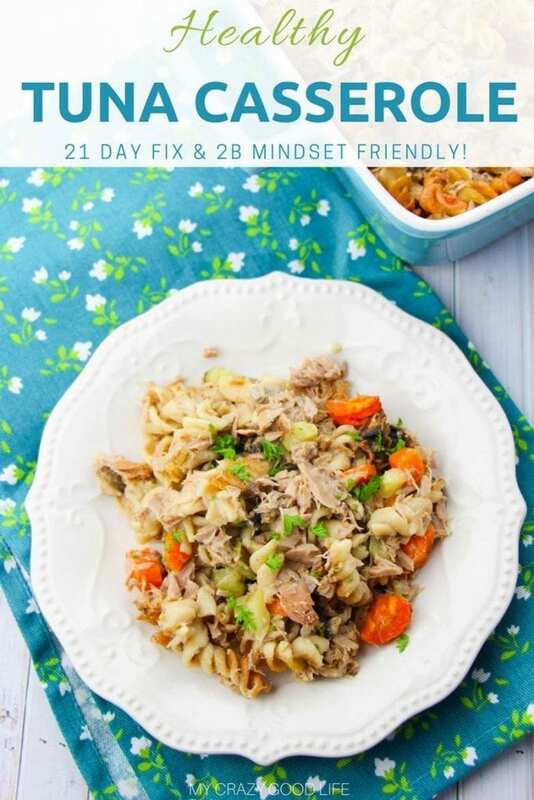 this 21 Day Fix Tuna Casserole every week! It’s healthy and works for my 21 Day Fix goals and I get to rest easy knowing we’re all eating some that is easy and good for us! This healthy tuna casserole is also a great lunch recipe for 2B Mindset. Can you freeze tuna casserole? Yes! 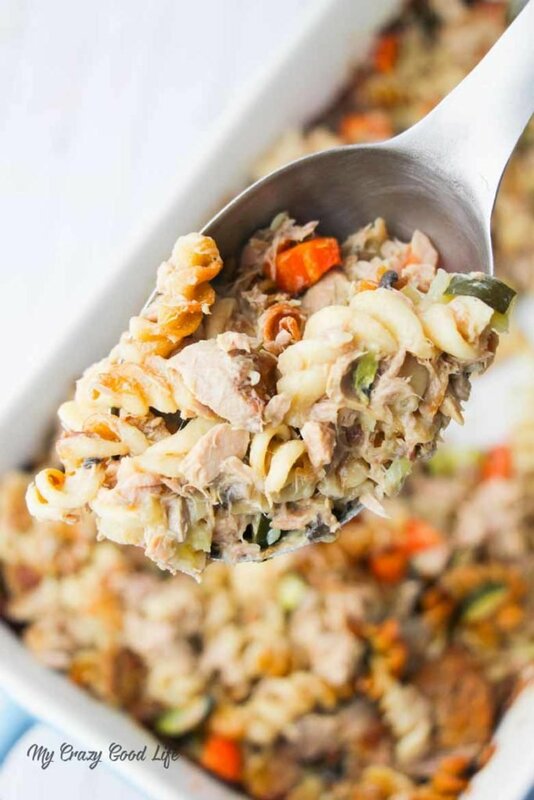 I often make this healthy tuna noodle casserole recipe and then freeze individual servings for my son to eat before work. I reheat the frozen tuna casserole by sticking it in the microwave for 2-3 minutes. Stir, then put it in again for 30 seconds at a time. Can I make this healthy tuna casserole on the stove? Absolutely you can! Boil the noodles and saute the veggies for 5 minutes or so in a different pot/pan. Add all of the ingredients together after the noodles are cooked and drained. I often make this tuna noodle casserole on the stove if we are running short on time! Casseroles are a go to for me. I have this chicken sausage version that I make a lot as well as this breakfast fajita casserole that helps me breeze through weekday mornings! I like having options like this easy and healthy tuna casserole on hand for busy nights. We can all eat this 21 Day Fix tuna casserole that’s healthy and quick. No complaints from the family, my 21 Day Fix plan stays on track, it’s a win win! 1. Boil noodles (about 3C dry, maybe a little over) until tender, strain. 2. Stir in vegetables, homemade soup, and tuna. 3. Combine all ingredients in a casserole dish and cover with foil. Bake for 25 minutes at 350 degrees. 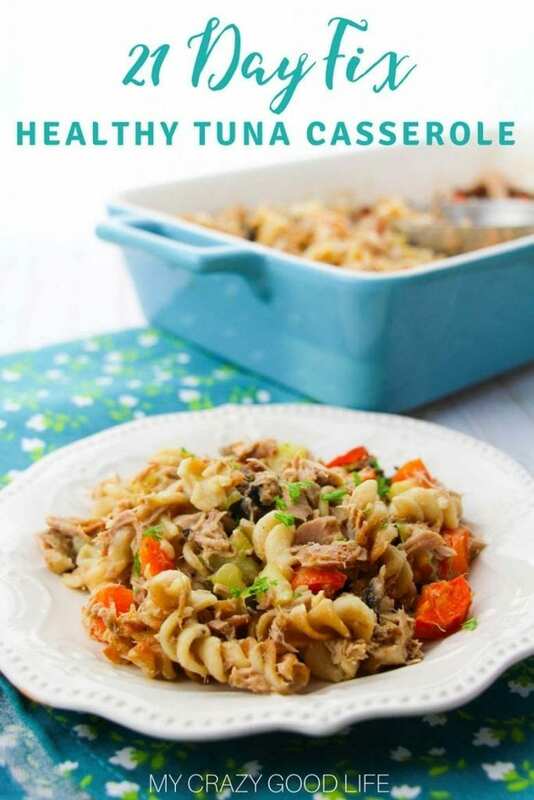 The great thing about this easy and healthy tuna casserole is that it is made with some great ingredients that are easy to pull together. My homemade cream of mushroom soup is so much better for us and I like that it’s cooked right here in my kitchen where I can see everything that goes into it. 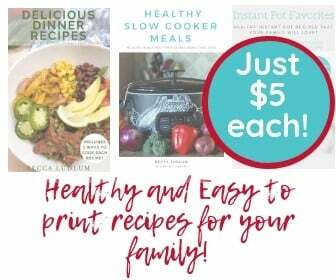 It doesn’t hurt that all of these ingredients are 21 Day Fix friendly. 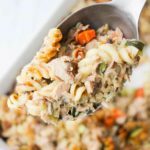 Making a 21 Day Fix tuna casserole doesn’t mean you have to sacrifice that rich and hearty texture! 1 1/2 cups of my homemade cream of mushroom soup is 3 Freestyle Smart Points. The only other thing in this recipe that you need to count under the new program guidelines is the pasta! The veggies, and the tuna are zero points foods. 16 oz of whole grain pasta is about 18 Freestyle Smart Points so you can adjust accordingly. On the Fix, this is a side dish–this recipe makes 8 servings, about 1/2 cup each. For one serving: 1Y, negligible teaspoon, just over 1/8 G, and 1/4R. You could definitely bump up the red and greens by adding more veggies and tuna if you’d like. Double the veggies and you’ve got a great 2B Mindset lunch! I’d personally double the tuna as well to get some more protein into my day. This healthy tuna casserole contains homemade cream of mushroom soup and whole grain noodles–perfect healthy comfort food for the days you need it most! This is the recipe that my family loves most, and can be adapted for your family as well! Boil noodles (about 3C dry, maybe a little over) until tender, strain. Stir in vegetables, homemade soup, and tuna. Combine all ingredients in a casserole dish and cover with foil. Bake for 25 minutes minutes at 350 degrees. Weight Watchers Counts: 1 1/2 cups of my homemade cream of mushroom soup is 3 Freestyle Smart Points. The only other thing in this recipe that you need to count under the new program guidelines is the pasta! The veggies, and the tuna are zero points foods. 16 oz of whole grain pasta is about 18 Freestyle Smart Points so you can adjust accordingly. 21 Day Fix Container Counts: On the Fix, this is a side dish–this recipe makes 8 servings, about 1/2 cup each. For the entire recipe, the count is: Noodles: 8Y Soup: 1.5 tsp and 1/3G Veggies: 1G Tuna: 2R For one serving: 1Y, negligible teaspoon, just over 1/8 G, and 1/4R. You could definitely bump up the red and greens by adding more veggies and tuna if you'd like.